Over the last year and a half, over 190 of Canada's finest artists from along the west coast have collaborated to create a stunning 11 foot x 21 foot mural. The mural is called Kunamokst, which is Chinook for â��togetherâ��. 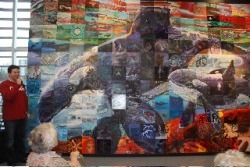 The mural is comprised of 231 original paintings that combine to bring to life a new, united image. There are no digital effects, and the artists did not know each other nor did they know what the final image would be. Artists as young as 16 years to over 90 years old have contributed their work. There are artists from many communities along the coast: internationally renowned artists, French Canadian artists, First Nations artists like critically acclaimed Roy Henry Vickers and April White, and iconic Canadian artist Robert Bateman. Many of the artists have been featured on the world stage as well. Special guest artists include California world renowned whale muralist Wyland and California muralist Judy Baca, who has a home on Galiano Island. The mural was officially unveiled in Vancouver during the 2010 Winter Olympics, as part of the Cultural Olympiad. Afterwards, it went "on tour" to locations in Vancouver and Victoria before arriving at its island home: Galiano. This spectacular mural is now on public display at the Galiano Oceanfront Inn and Spa, 134 Madrona Drive.The mural is just 6 minutes walk from the BC Ferry Terminal, through the Village. Leave your car behind and make an "arts tour" to Galiano Island. The Mystery and the Magic of the Mural come from the unknown larger plan created by the Mural Mosaic artist, Lewis Lavoie of Mural Mosaic. His design captured the heart of the theme and, unknown to any of the individual artists, the overall vision. The Mystery? .... no one knew "the Big Picture"; they did not know what they were painting. Each artist was given a panel, and asked to follow its colours and general outline, and they could create any piece of work that they wished, as long as it was built on the theme of the wild West Coast. For months, suspense built, as individual panels were gradually revealed. Finally, at the unveiling, the artists got to see what we now can all enjoy: a beautiful mother orca and her calf. 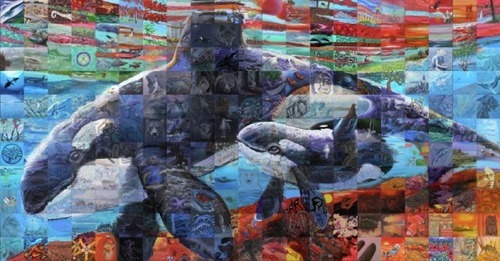 You can visit The Kunamokst mural in person, on Galiano Island, open daily, or you can visit it virtually, online at http://www.muralmosaic.com/kunamokst.html Be sure to "Click on the eye of the whale". Limited edition prints of the mural, along with books and postcards, are available for purchase at http://www.kunamokstmural.com/gift-shop.html or through the Inn at www.galianoinn.com or 1-877-530-3939. Proceeds will be used to pay the costs of creating the mural and to support the arts on Galiano Island and in the surrounding area.